The standard history of automobiles reads that in just a few decades cars made horse-drawn carriages obsolete. 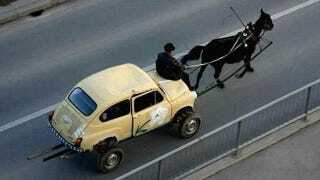 Poverty and resourcefulness, however, bring us this fine Eastern European counterexample of a horse-drawn Fiat 600. It looks like feeding and keeping a horse is still less expensive than maintaining a car, at least in the case of this very practical cart driver.